TOKYO, Japan, March 30, 2011 (ENS) – Tokyo Electric Power Company has decided to decommission the four damaged reactors at the Fukushima Daiichi nuclear power plant, Chairman Tsunehisa Katsumata said Wednesday. This is the first time the utility has said it will decommission the four reactors, which were damaged by the tsunami unleashed by the magnitude 9.0 earthquake on March 11. “I would like to offer my sincerest apology for causing grave concern,” Katsumata said at a news conference at the company’s headquarters in Tokyo, the first he has given since March 13, two days after the nuclear power plant was damaged. He said officials are looking at the containment of radiation by covering the reactors with a concrete sarcophagus, as was done for the Chernobyl nuclear power plant in Ukraine, which exploded and caught fire in 1986, spreading radiation across much of Europe. Authorities also are considering covering the damaged reactors with special fabric sheets to limit radiation. Today, radiation leaking into the Pacific Ocean near the power plant reached its highest level yet – 3,355 times the usual amount of radioactive iodine, raising fears of contaminated seafood. On Friday, the radioactive element plutonium was found in soil at the plant. Cooling systems failed at the Fukushima Daiichi power plant’s Unit 1, 2, 3, and 4 reactors, as the tsunami destroyed first outside power sources, then emergency backup generators designed to pump water through the cooling systems. 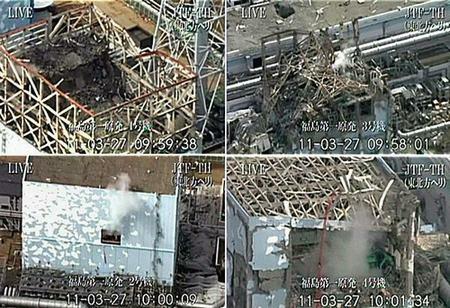 Fuel rods have been damaged as a result, releasing radioactive contaminants. TEPCO is working to cool the reactors and control highly radioactive water leaking from them into air, sea and soil. “It will take time” to stabilize them,” said Katsumata. These handout photos from TEPCO show damaged reactors at the Fukushima Daiichi nuclear plant: Unit 1, upper left; Unit 2, upper right; Unit 3, lower left; Unit 4, lower right. He said a large volume of highly radioactive water beneath the power plant is hindering efforts to cool the reactors. Radioactive iodine and cesium have been found in water from a tunnel outside the Unit 1 reactor and in the basement of the turbine buildings of reactors 1, 2, 3 and 4. Salt residue from sea water pumped in to cool the reactors must be removed to prevent corrosion, said Katsumata. Fresh water is now being supplied to cool the reactors through the efforts of Japan’s Self Defense Forces working with the U.S. Navy. Residents forced to evacuate their homes within a 20 kilometer radius of the plant will not be able to return for several weeks, Katsumata said. The chairman has taken control of Tepco’s operations after President Masataka Shimizu was hospitalized for extreme fatigue and high blood pressure on Tuesday. 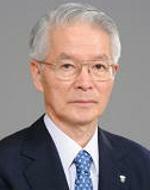 Katsumata also has taken Shimizu’s position as deputy chief of a TEPCO-government joint task force on the nuclear accident. Prime Minister Naoto Kan said Tuesday that TEPCO was not adequately prepared for the magnitude of the tsunami that shut down the plant’s cooling systems. Tokyo Governor Shintaro Ishihara Friday said company was too slow in using sea water to cool the unstable reactors. “There wasn’t any hesitation in using sea water,” Katsumata said at a news conference today. The company did “the best possible” to deal with the accident, he said. Immediate safety upgrades will be put into place at nuclear plants throughout Japan, the Japanese government said Wednesday. The goal of the regulations is to make nuclear plant operators capable of preventing damage to reactor cores and spent fuel rods, prevent the emission of radioactivity and recover cooling mechanisms in a situation where a tsunami compromises a plant’s cooling systems, said Trade and Industry Minister Banri Kaieda. Nuclear power plant operators will be required to inspect their equipment and test their ability to withstand a tsunami, the government said. In addition, plant operators will be required to make emergency plans and run an emergency drill, acting as if cooling systems have been compromised, Japan’s Nuclear and Industrial Safety Agency said in a statement. Nuclear power plant operators also will have to ensure they have access to an alternative power source if emergency power fails and they must plan to implement emergency cooling water solutions.